Catalan artist José Casanovas (1934 – 2009) was well-known and well-loved by lots of readers, appearing as he did in many British comics over a number of decades. His detailed, stylish, and above all fun art was distinctive and he was credited in various publications, so it is easy to pull together quite a long list of his work (though no doubt still incomplete). Many British readers think of him as a 2000AD artist – that is how I first came across his name myself – and therefore perhaps as an SF artist primarily. If you count up the stories he drew and the titles he appeared in, though, by far the majority of his work seems to be for the girls’ comics market. Mistyfan has recently done a post about “Sue’s Daily Dozen” in which she made the point that Casanovas is known for science fiction. 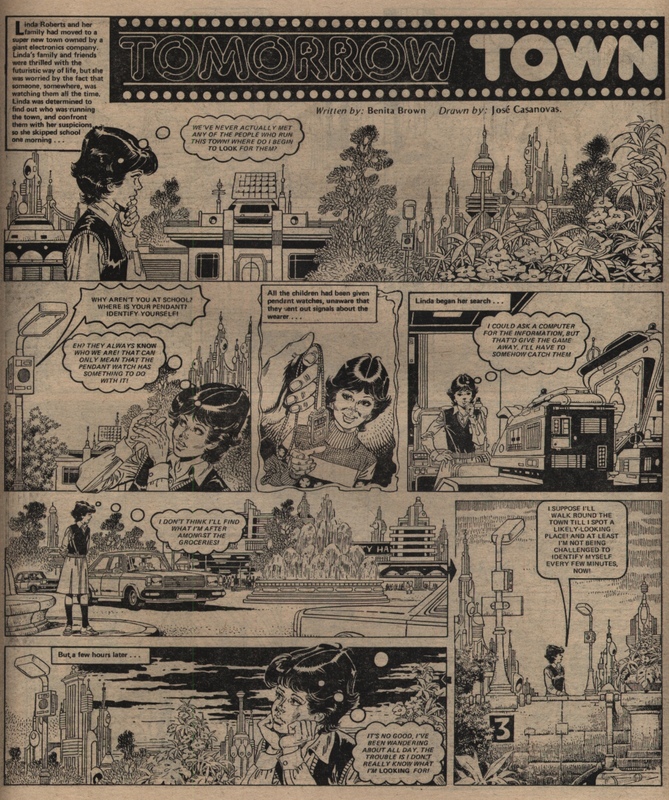 There is one science fiction story done by him in a girls’ comic, namely Tammy‘s “Tomorrow Town”, which I take the opportunity to reprint here as being a piece of art that would otherwise not be likely to get a showing on this Jinty-specific blog. Following Casanovas’ death in 2009, Steve Holland wrote an obituary Bear Alley post here, drawing also on the Spanish-language blog Tebeosfera’s post here. (Do follow this last link to see some lovely artwork from an adaptation of Pollyanna done for the local market.) There was also an interesting comment on 2000AD fan blog the Prog Slog about Casanovas’ work in the boys’ science fiction comics market. He drew well-liked characters Max Normal (some Max Normal art by Casanovas can be seen here) and Sam Slade Robo-Hunter (after Ian Gibson had stopped drawing this latter character). He also drew a number of one-off stories in 2000AD, and a story in Starlord, and people characterise him as a 2000AD artist therefore. 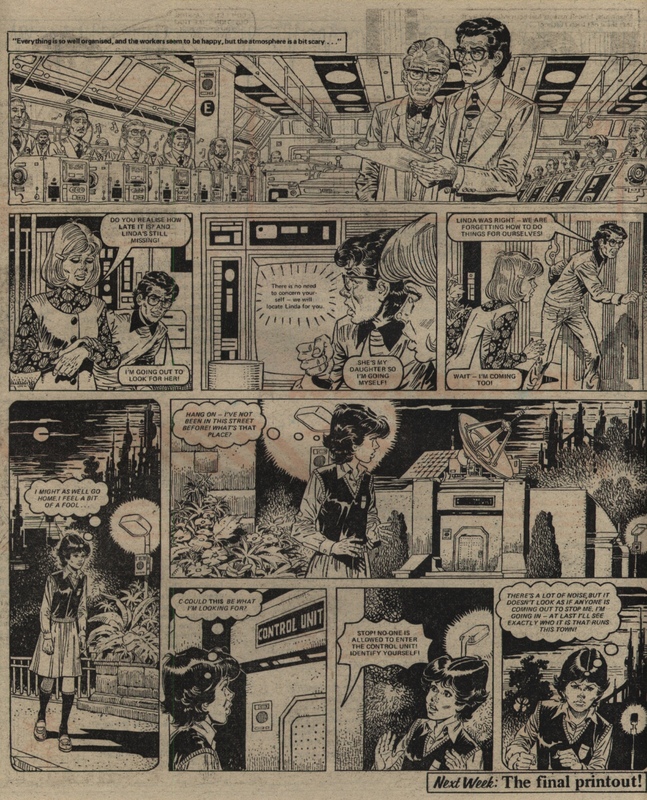 The Prog Slog comment here clarifies that: “Casanovas early work for 2000AD, Starlord etc. was sporadic. First appearance was a ‘Future Shock’ in Prog 70 (24 June 1978) a 1.5 pager called ‘Many Hands’. “Good morning Sheldon, I love you” was his next, a six page future shock style one-off written by John Wagner in Starlord 11 (22 July 1978). He drew another one-off Wagner [story] in Starlord 16. There’s a gap then until Progs 148 & 149 (January 1980) where he does a 2-part Ro-Jaws Robo-Tale. He then draws the 11 page Mugger’s Mile by Alan Grant, the first ever Max Normal strip (“The Pinstripe Freak (He’s Dredd’s informer)”) in the first Judge Dredd annual (1981). He goes on to draw more Future Shocks in Prog 220, 241 and 245, another Max Normal in the 1982 JD annual, and again in JD 1983 annual. In the 1982 Sci-Fi Special he draws his first Dredd proper, a 10 pager by Wagner – The Tower of Babel. His first Dredd in the weekly is the excellent “Game Show Show” 2 parter in 278/279, August 1982, Wagner again. He did the second ever ‘Time Twister’ in Prog 295, a 4 pager called Ultimate Video. And that’s as far as my data goes for now, by Prog 300 he’d done 77.5 pages: 32.5 in the weeklies, 10 in specials, 23 in annuals and 12 in Starlord. According to ‘Barney’ online (http://www.2000ad.org) his last work was in Prog 822 (Feb 1993), Robo-Hunter”. The tally of his pages for 2000AD and the like must therefore surely be far outnumbered by the 90+ episodes of his run on Dora Dogsbody in Jinty alone!